"Hit me with your boost shot." Is there such a thing as too much horsepower? The answer is yes!, but that doesn't mean some people won't go ahead and turbocharge a Kawasaki ZX-11 anyway!!! Frightening, isn't it, how a solitary man working in his garage can assemble an explosive device of awesome power, using nothing but off-the-shelf ingredients. And we don't mean a bomb. Consider Greg Mace: A former drag racer who gets antsy during the long, cold winter months. In his heated garage, he began work on a winter project destined to "dominate the streets." When the garage door popped open this past spring the device that rolled out looked fully capable of launching a terror campaign -- but terrifying mostly for the person turning the throttle. The basic components Greg used to construct his project were a 1993 Kawasaki ZX-11 and a Mr. Turbo computerized fuel-injected turbo kit, thought this was just the starting point for a bike that would consume $35,000. Greg's payoff was horsepower, in vast quantities. In the bike's first session on a dyno, running at a modest level of turbo boost the ZX-11 produced 290 horse power at the rear wheel. With more boost and higher fuel pressure, Greg figures 350 horse power is within reach. Hard to believe? A similar ZX-11 with nitrous-oxide injection owned by drag racer Terry Kizer of Mr Turbo won the AMMI horsepower shoot-out at Daytona Beach with a howling 459 horse power at the rear wheel. Of course, that kind of power is more like a lab experiment or a nuclear test blast. There's no conceivable way of using it in a stock-chassis ZX-11 -- absolutely none at all. Arguably, you could say the same thing about the nearly 300 horse power of Greg's ZX-11, and he is the first to admit riding the bike with that much power is, as he puts it, "unreal." "I used to run a drag bike that would do the quarter mile in 8 seconds flat at 165 mph. This bike is 100 horse power more at the rear wheel. "This is unpredictable, volatile horsepower. It's really hard to explain what it's like. You're on the edge of the envelope all the time. It's either going to spin the tire or wheelie. You can be at 140 mph and the tire is skipping along the ground. "It's pretty well impossible to open the throttle unless you're in fourth or fifth gear. It pulls in fourth and fifth gears like the stock bike pulls in first or second." Greg has been a regular caller to the Mr. Turbo offices. "Terry Kizer's secretary has told me that when he comes back from riding his bike on the highways in Texas his eyes are like saucers. This is a guy who's run 6 second quarter miles at 220 mph. Kizer agreed that they had long reached the point where: "you can make more power than you can use.... It's just about impossible to ride." 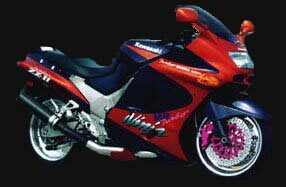 Talking about a ZX-11 with more than 350 horse power, Kizer said, "It accelerates so hard and so fast. It wants to wheelie in sixth gear. You have to be so careful. I mean, one little ripple or bump in the road, and you're history." Although there's nothing particularly new about the turbocharging concept, what has changed is the sophistication and reliability of modern turbo packages. Greg is a veteran of "the stone age of turbocharging, the '70s. 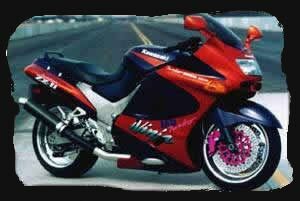 I had a Kawasaki Z-1R Turbo which I blew to smithereens. This kit's incredible compared to what we had in those days." Greg spent $8000 acquiring the Mr. Turbo kit and did the installation himself over the winter. "The kit is very well made and fits very nicely, but it's still not for your average home mechanic." The fuel injection is a modified Bosch automotive system, which allows relatively easy adjustments via the electronic module located in the tail section. Removal of the stock airbox and carburetors provides plenty of room beneath the gas tank for the turbo plumbing and fuel injection. 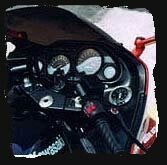 The turbo unit itself is a Garrett F40, adapted for the ZX-11 by Mr. Turbo. 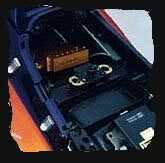 Space for it was created by removing the rad fan and repositioning the oil cooler and radiator forward slightly. A spacer moves out the fairing on the right side of the bike and a cut-out was necessary for the exhaust, but otherwise the fairing and its mounts are stock, providing a deceptively innocent profile. Orient Express turbo pistons reduce compression to less than 10:1,which is still fairly high. But to prevent detonation, the bike must run on VP16 racing fuel, which costs Greg $70 to fill the tank for an afternoon's amusement. There's virtually no turbo lag and boost builds quickly from 5000 rpm. Considering the engine's current output, it's remarkably close to stock. Heavier valve springs were installed, but Greg was assured by Kizer of Mr. Turbo that the stock connecting rods were sufficiently strong, despite his willingness to pay for Carrillo rods. Mr. Turbo did supply a modified oil pan and a bypass arrangement that directs more oil to the crankshaft main bearings. Kizer says he's yet to see a ZX-11 with rod failure that wasn't the result of an oiling problem, but he still recommends Carrillo rods for bikes making more than 300 horse power. The transmission uses an electrically activated air-shifter with an on-board compressor and tank. Greg shifts the bike conventionally at low speeds, but with the engine running on boost, gear changes become more difficult, and the consequences of a missed shift are potentially disastrous. The horn button now signals upshifts when necessary. Greg has also fitted an Orient Express lock-up clutch to prevent slipping, since the engine has the potential to spin the clutch free in fourth gear under full throttle. Although Greg has insisted on preserving the ZX-11's stock wheelbase, he hasn't ignored the need for upgrading the chassis to deal with the bike's speed capability. After consulting with Noleen Racing in California, who Greg says seemed shocked when he told them what he was doing to his ZX-11, he sent off his fork to be revalved for firmer springing and damping. Noleen also supplied a remote-reservoir Ohlins shock and advised that the rear ride height be lowered to rake out the front end more for greater stability. Greg was ecstatic with the result, claiming the compliance and control are both greatly improved. Greg replaced the 5.5-inch stock rear wheel with a 6.5-inch Performance Machine racing wheel and eliminated the cush drive. A $250 investment in a Regina heavy-duty racing chain paid off with a quieter, smoother transmission of power, claims Greg, who also raised gearing with a Coyote 42 tooth sprocket machined from aluminum billet. The front wheel was replaced by a Performance Machine wheel, but one designed for street use. Greg wasn't interested in losing weight there or sacrificing any strength during wheelie landings. Performance Machine also supplied the four-piston calipers and 13-inch front discs designed to haul the ZX-11 down from absurd speeds. Overall weight of the bike has been reduced by about 70-lbs thanks to the lighter turbo exhaust system, which has a carbon-fiber muffler, the Performance Machine wheels, and a carbon-fiber dash, which houses a turbo boost gauge and a pressure gauge for the air-shifter bottle. Soon after completing the bike, Greg took it to a Dynojet dynamometer. "They'd just had a Harley on there that made 75 horse power," says Greg, "And they thought that was pretty good. Then this bike idles up like a pussycat. The guys around the dyno had their jaws drop to the floor. "The noise was incredible. There's this horrendous, sucking vacuum sound through the intakes. The dyno was brand new and I think they were afraid I'd break it." That initial session netted 290 horse power, with just 14 psi of turbo boost. "I plan to crank up the boost to 20 pounds just to see what happens," says Greg, who can crank up the boost by turning a screw on the turbo wastegate, "but at the moment I'm just trying to deal with 14 pounds on the road." Kizer says Greg will have no difficulty making 350 horse power. Beyond that point he recommends using stronger studs in the cases and cylinders. His bike that won the power shoot-out at Daytona also used a larger turbo and an intercooler, which Kizer says were responsible for most of the power difference. The charge of nitrous oxide was a relatively small contributor reaching the 459 horse power mark. "We took that engine apart when we got it home," says Kizer, "and everything looked fine." Is there such a thing as too much power? Obviously, the answer is yes. At a certain point, the pursuit of horsepower ceases to have much to do with motorcycling and becomes more like a backyard Manhattan project. "Its something you create in your garage, put together yourself, and it makes a statement," says Greg, who plans to use the bike in promotional materials. But his ZX-11 is more than just an image-builder. "My wife gives me lectures every time I go to leave the driveway." "I do treat it with respect."